Students on this dual degree will benefit from the reputation and teaching specialisms of both UCL and Sciences Po in France. The programme offers specialisation in a humanities or social science subject, combined with a broad base in history, law, politics and philosophy, and fluency in a European language. A humanities or social science subject (or Mathematics) preferred. Mathematics at A* required for full Economics specialism if chosen. French or Spanish required if one of these is to be studied as a major language. Other language requirements may apply depending on the campus chosen - see www.ucl.ac.uk/r992-entry. A score of 19 points in three higher level subjects, with no score lower than 5. Higher level subjects to include French B or Spanish B at grade 6 if one of these is to be studied as a major language. A humanities or social science subject (or Mathematics) at higher level is normally a requirement. Mathematics at grade 7 at higher level is required for the full Economics specialism, if chosen. Other language requirements may apply depending on the campus chosen - see www.ucl.ac.uk/r992-entry. D2,D3,D3 in three Cambridge Pre-U Principal Subjects. French or Spanish required if taken as major, plus a social science or humanities subject (or Mathematics) preferred. Mathematics at D2 required for full Economics specialism if chosen. A1,A,A at Advanced Highers (or A1,A at Advanced Higher and A,A,A at Higher). French or Spanish required at Advanced Higher if taken as major, plus a social science or humanities subject (or Mathematics) preferred. Mathematics at A1 required for full Economics specialism if chosen. Successful completion of the WBQ Advanced Skills Challenge Certificate plus 2 GCE A levels at grades A*AA. French or Spanish required if taken as major, plus a social science or humanities subject (or Mathematics) preferred. Mathematics at A* required for full Economics specialism if chosen. Spend your first two years of study at Sciences Po, the most prestigious institution for social and political sciences in France. Benefit from UCL's world-class teaching system and the insights of its renowned humanities, language and social sciences scholars. The complement of social science and humanities specialisms on offer at UCL and Sciences Po enables a cohesive programme of study throughout your degree. The programme offers international mobility and an overseas experience. These features have become invaluable assets for all young graduates starting a career. Modules fall into three groupings: common core, language and social sciences electives. The European common core involves working in a multidisciplinary environment, gaining insights into a range of academic disciplines and engaging critically with competing analytical perspectives. In the last two years at UCL you may specialise in any of these major subjects: Economics, History, International Relations, Law, Philosophy, and Politics. If you intend to specialise in Economics, Law or History while at UCL, you must take optional modules in the relevant discipline at Sciences Po. Specialisation via optional modules in a social science or humanities subject. Your formal timetable will involve a programme of lectures, seminars and workshops. As well as the core modules, and modules designed specifically for students of this dual degree at Sciences Po and UCL, you will choose options in other departments according to your area of specialisation. This gives you access to a range of UCL's successful teaching approaches. 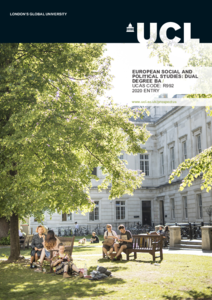 Detailed course descriptions are available on the department website: European Social and Political Studies: Dual Degree BA. The Dual Degree gives you the wide-ranging employability of graduates in PPE or international relations, but with the added maturity of study in two different countries, and the advantage of fluency in a European language - essential for anyone seeking a career in a European context, and increasingly valuable for the financial sector or media posts. ESPS and Sciences Po graduates combine specialised knowledge of a humanities or social science with a broad foundation in economics, law, history, sociology and politics and, importantly, proficiency in another language or languages. On top of this, they have the independence gained by studying in two countries. In particular, students are able to demonstrate their aptitude for research by writing a research essay. This unique combination yields a significant advantage when it comes to securing funding for further research or getting a foothold on a competitive career ladder. A wide variety of sectors are open to Sciences Po and ESPS graduates including auditing, finance, journalism and media. 1st and 2nd year students pay fees directly to Sciences Po (for details please refer to: www.sciencespo.fr/admissions); in the 3rd and 4th years fees are paid to UCL (£9,250 in 2019/20). If you live in Europe and you meet (or are expected to meet) our selection criteria, you will be invited to an assessment day. This will involve an interview conducted by Sciences Po staff.